Despite export log prices being well off their highs of last year, and A grade being below $100/JAS m³ for several months now, many New Zealand ports and port service providers are reporting record-high log volumes. This is resulting in periods of logs being shut out from delivery and more off-port storage. NZ at-wharf-gate (AWG) prices were either steady, or slightly up, for export pruned logs, but down $3-$8/JAS m³ for unpruned grades. Indian and Korean sales are returning slightly higher (AWG) prices which is supporting price of the lower-end utility, industrial and pulp grades (K, KI and KIS). Log stocks in China are starting to drop due to reduced supply of logs out of the USA (compared to the second half of 2011) and stronger off-take to log processors. Expectations are that Q2 supply volumes will be lower due to the lower market price and also the fact that the American lumber market has been improving, as has the economy. Currently inventory is reported to represent about 60 days supply at current off-take levels. Whilst CFR price (price of logs delivered to the destination port) has remained steady at around USD125/JAS m³, some market participants are starting to talk about possible price rises in the near-term (up some USD10/JAS m³). This is still speculative at this stage and contrary to usual seasonal patterns that sees an easing in CFR price as Asian markets hit their slower hot season. This year, however, CFR price is much lower and could result in reducing supply levels, supporting a price lift. For example, A grade averaged US$156/JAS m³ through Q2, 2011. The slight improvement in the NZ$/US$ cross rate from 0.83-0.84 at the beginning of March eased slightly to 0.81-.82 at the beginning of April creating a small off-set for at-wharf-gate prices. However, most banks are forecasting modest near-term strengthening of the cross rate. The China "soft-landing" scenario remains a valid expectation with good manufacturing data out recently. The rally in ocean freight rates reported last month continued with rates now in the low-mid US$40s/JAS m³. This has been the main driver of reduced AWG prices in April with a bigger range in prices being posted amongst exporters and amongst ports. This is due to a larger-than-usual variation in ocean freight rates depending on when fixtures were contracted, and the number of load and discharge ports. Bunker (ship fuel oil) prices continue to add to ocean freight costs now comprising over 60% of total ocean freight costs. This is high-lighted in the chart below. 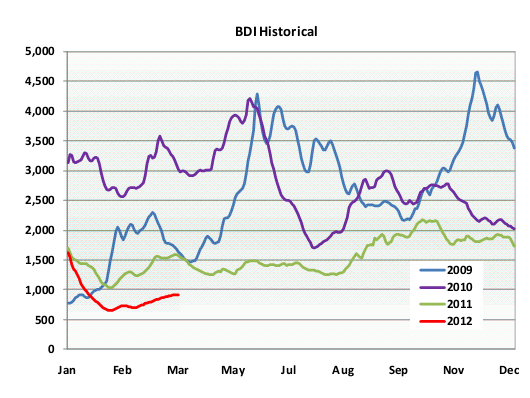 The Baltic Dry Index (DBI) is actually still tracking historical lows; it is the high bunker costs that are causing the high freight rates, as well as a short-term supply squeeze in the Handy-size market. There is a gradual upward trend in new dwelling consents, but monthly figures are erratic (February fell by 6.7% after rising 8.3% in January – seasonally adjusted). 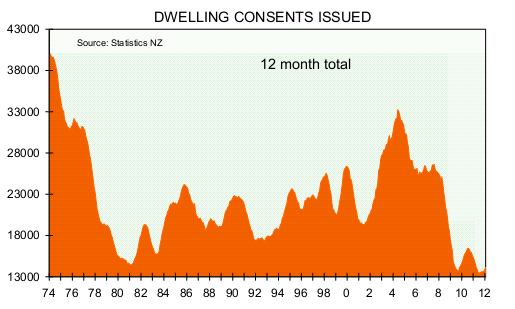 However, the 14,157 consents issued over the past year is still 38% below the ten year average of 23,000. The Christchurch rebuild impact has yet to be seen in this metric. Non-residential consents were strong in month of February but for the year to the end of February, they are only ahead 1.1% on the prior year. The trend appears to be stable, rather than any breakout uptrend. In Australia, an important market for NZ processed wood products, the theme continues to be a booming resources/minerals sector, but weakness everywhere else. Continued cuts in interest rates are expected to try to stimulate the rest of the economy. Last month Pacific Wood Products of Napier announced its planned closure with the loss of 41 jobs. The company manufactures a range of timber products for appearance grade use in house renovation and construction. Its main market was Australia. The soft demand for these products in Australia and little prospect for improvement in the next 12 months was cited as the driver behind the decision. In conjunction with general economic weakness, the flooding is believed to have affected housing starts and spending on home renovation. In addition, cheaper products from Chile have taken market share and eroded prices. Domestic log prices were generally unchanged through the quarter two negotiation round, although regionally there were both price increases and price decreases depending on grade. Export unpruned log prices fell on average $5/JAS m³. Export pruned prices rose $1-3/JAS m³.